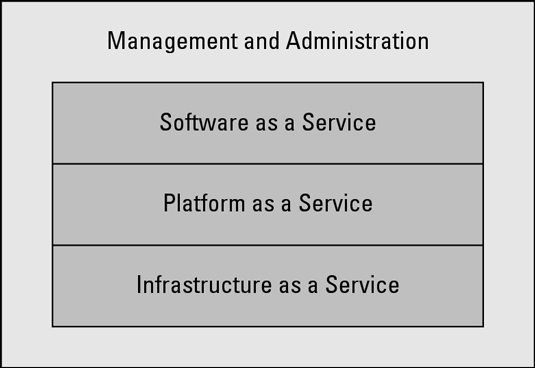 The following figure shows the various types of cloud services as three distinct models: Infrastructure as a Service, Platform as a Service, and Software as a Service. In reality, the lines between the different delivery models are often blurred. For example, a Software as a Service (SaaS) vendor might decide to offer separate infrastructure services to customers. Infrastructure as a Service is the delivery of computer hardware (servers, networking technology, storage, and data center space) as a service. It may also include the delivery of operating systems and virtualization technology to manage the resources. Platform as a Service includes the delivery of more than just infrastructure. It delivers what you might call a solution stack — an integrated set of software that provides everything a developer needs to build an application — for both software development and runtime. Simple multi-tenancy: Each customer has its own resources that are segregated from those of other customers. It amounts to a relatively inefficient form of multi-tenancy. Fine-grain multi-tenancy: This offers the same level of segregation but is far more efficient. All resources are shared, but customer data and access capabilities are segregated within the application.